The Nano debuted in 2008. It was expected to be a historic event – the launch of the cheapest car ever to be sold on the planet. Auto analysts across the world prophesized the Nano would be a game changer for the Indian auto industry. CRISIL announced Nano would expand the Indian car market by 65%. The logic seemed impeccable. More families in India would be able to afford a car now, wouldn’t they? Media across the world went gaga over this “revolutionary” development in the history of car making. By 2014, Nano sales were way below initial expectations. Experts now have an explanation for why Nano failed. A car is a status symbol and hence people would never want to be associated with a “cheap” car like Nano. Again the logic seems impeccable. Experts in Goldman Sachs predicted oil prices to hit $200 per barrel in 2008. The narrative of large growing consumption and limited reserves in the world made everyone buy into those numbers. Within few months of the announcement, prices crashed to $60 per barrel. Armed with hindsight knowledge, experts (different group from the first one) explained the reason for such a drop – demand dropped with overall economic slowdown in the world, whereas suppliers took time to throttle supply. These two developments highlight not just massive blunders in prediction by experts but also how easy it is to find the “cause” for an event after the event has occurred. Are these amongst those few cases of forecasting blunders? Now in 2016, many Indian companies in steel and infra, including the large ones, are facing a debt crisis. Companies are not earning enough to pay their commitments to banks and default in repayments is forcing banks to declare higher than usual non-performing assets. We are facing a “prediction trap”. The ability to explain events in hindsight creates a class of “false” experts who can lure us into believing that they can also predict the future. There is a minority but a growing tribe of contrarian social scientists seriously questioning our ability to predict economic cycles, oil prices, movie hits, fashion trends, product hits, cyclones, interest rates or even the demand for products in the next quarter. Philip Tetlock, a professor from university of Pennsylvania, did a two-decade-long study on the predictive ability of ‘experts’. He asked about 300 experts to make 28,000 predictions. The same were evaluated over a period of twenty years. The conclusion of the study was baffling. When it comes to making long-term predictions, the experts’ ability to predict was almost equivalent to a dart throwing chimp’s ability to hit the bull’s eye. A study of such magnitude establishes what many of us would have suspected all along. Do your own test if you like. •	Ask the founder of a 20-year-old successful company, if everything worked out according to a long-term strategic plan. •	Scout twenty-year-old newspapers to look at expert predictions made about what the world would be in future. •	Check expert analysis of possible impacts of technology fads in the years when fad was on. But before we dump all kinds of forecasting, it is also important to understand when forecast behaves less erratic. Forecasting much better and usable, when one is much closer to the event horizon. For example in the domain of weather forecasting, predicting a day’s weather is reasonably accurate when you are doing it 2 to 3 days before, rather than few weeks or few months away. At the same time, forecasting beyond a particular period, let’s call it the relevant period, is close to gambling, because the level of error is so high, that it is of no practical use. The length of this “relevant period” depends highly on the dynamism of the domain one is trying to forecast. Many understand this phenomenon and try to solve the problem with concept of rolling forecasts – where forecast are continually revised after a fixed period. However rolling forecasts creates more havoc, when reaction time of the system is much longer than the frequency of forecast revisions. Why forecasting markets is difficult? The starting point of any business planning is an analysis of how the demand will shape in the future – the market. Most forecasting models used for estimating demand are linear regression models, which assumes variables have an independent and proportionate impact on demand. 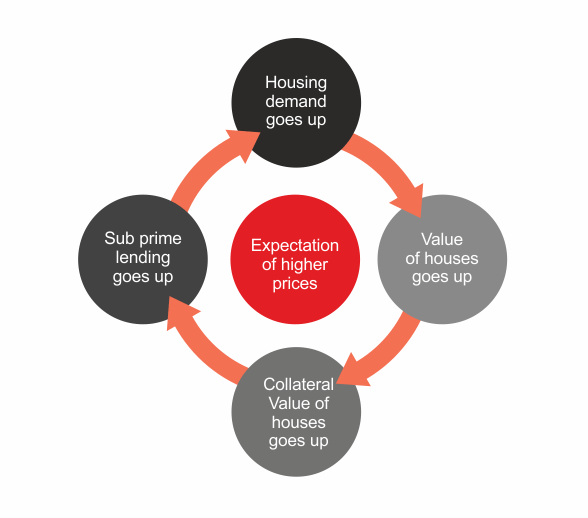 These models ignore one significant variable – competition’s reactions, counter strategies and subsequent reactions of players or agents in the market. If markets are full of players (or agents) who react to each other’s actions and these reactions impact the numbers for every player, then ignoring these in the model is a big flaw. Mathematically speaking, these interactions of agents bring in feedback loops making the model iterative and hence non-linear in nature (effect tampering the inputs). 2. A large intervention can lead to no change at all. An elaborate marketing campaign can lead to no change in market share or sales trend, while in other situations a fashion item or a video becomes viral without much effort from the marketer. When there are multiple feedback loops in a complex system, it is difficult to predict which change will cause what effect – a multiplier impact or nothing at all. This “small change, multiplier impact” or a “big-intervention – no change at all” makes prediction tough for complex systems, particularly if one is looking for a system level outcome, like demand number, at a point of time. However, these patterns of loops and their impacts are well understood, once they are formed. This helps us understand events in hindsight. The financial crisis of 2008 and its links to risky products of banks are now well known. Some experts, outside of the entire system, were able to see the causal loops forming and were able to predict the downhill roll to crisis. But for the people, who were in charge, the detection was late and hence the reaction time was not fast enough to prevent the downward slide to a full-blown crisis. Vicious loops can be systematically reversed if they are well understood just after they are formed, and with the help of an early detection and a fast reaction system. This approach makes it possible to treat cancer when it is detected in the earlier stages. So the only way to deal with an uncertain complex market is to hold on to any commitment of resources and wait till point of time when the uncertainty actually reduces and it becomes nearly certain. This implies that we should develop an ability to understand what is happening around us and develop fast reaction systems. Few organizations are doing it in a limited way, particularly when it comes to managing operations and supply chain. For example while most fashion retailers try to predict trends about 8-9 months before the season and end up with stock outs and surpluses, Zara observes the hits in the market and delivers the new product in 15 days flat. Zara has the fastest new product development lead-time in the entire industry. While others look to buying wizards who try to predict trends to account for supply lead times, a year in advance, Zara reacts to fashion trends after they emerge in the market. Zara’s agility protects it from losses that result from typical large markdowns of fashion duds and at same time allows it to gain sales from popular items that hit the market without delay. It is no wonder that Zara has one of the highest profitability in fashion retailing. Back home, Fleetguard Filters in India follows a unique pull based distribution model where bulk of the inventory stays in the central warehouse (away from market) and moves to downstream consumption locations only closest to real demand based on immediate daily pull signals rather than a monthly forecast or a pre-determined target set at beginning of the year. This enables the company to divert stocks to locations of higher demand and prevent over stocking in locations with lower demand. It enjoys one of the highest stock turns in auto parts distribution (20 turns) with unmatched CAGR growth of 25% over last nine years despite the two economic slowdowns. These companies highlight an important management paradigm – they have accepted the fact that as far decisions on creation and movement of inventory is concerned – they do not know the future! Accepting the paradigm that future is unknown is big deal. It means that companies cannot commit to a long-term business plan. This is because a business plan is just one of the future scenarios which may or may not materialize. In an environment where competition is reacting with counter strategies every other month, committing to a yearly forecast is likely to be highly erroneous. This is because the yearly forecasts ignore the monthly feedback loops and counter reactions. When such organizations create an annual business plan based on sales forecast and converts it into static targets for every department, everyone in the organization becomes committed to a scenario. When the same targets are used for annual performance evaluation and annual incentives, the rigidity of the organization further goes up. This is because, when targets are set in an uncertain environment, it becomes difficult to assess if the numbers were achieved/not achieved because of individual related issues (capability or efforts) or because of change in external conditions. At the same time, people resort to gaming to tamper numbers. This leads to situations where Goodhart’s law becomes the reality –when a measure is converted to targets, it ceases to be a good measure. 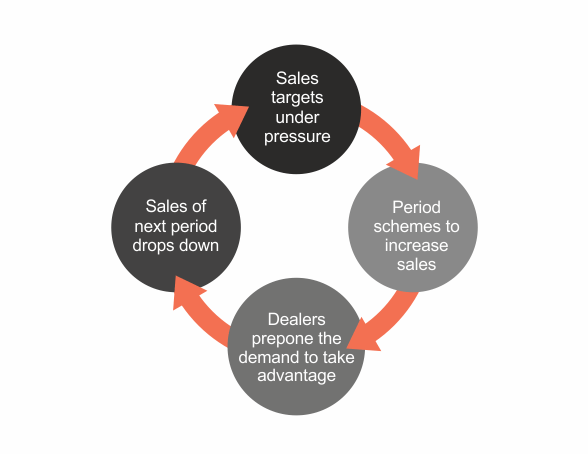 For example when sales targets are introduced, sales stops being a measure of real demand. (In many consumer goods organization with strong sales incentives, individuals “adjust” efforts to prevent overachievement, to prevent undue upward revision of targets in next period). This tampering of measures, slows down organizations, delaying the time to sense changes in external environment conditions – thus delaying responses. The cycle of “Forecast-Budget-Targets-Variance Analysis” slows downs organizations as they miss on sensing abilities and get busy in meeting their “numbers”. Is this the reason why Nokia or Kodak failed to see the reality of the market, while everyone outside saw it coming? Is this a reason why a large organization slows down dramatically and becomes vulnerable to a disruption? Maybe! It is not only that markets have high levels of unpredictability but also any attempt to force a certainty by forecasts and targets, slows down organization. For building rapid reaction systems, organizations need to ruthlessly cut lead-time not only for production, distribution, new product development and capital projects but also managerial decision making. While rapid reaction system is good to exploit the emergent opportunities but there is also a need to be the trendsetter or the opportunity creator. Since one cannot be sure of ones’ ideas, It is important to rely on small-scale representative tests or experimentation rather than upfront investments with massive risks based on a “sure” forecast. So innovative business models, marketing strategies or new products need to be tested out, while having an ability to do rapid ramp up for a mass roll out on success signals, before competition can even blink. However scale of tests should be such that a complete failure does not wipe out the company. If the innovation of driverless cars fails to catch up, it should not wipe out the accumulated financials of a company trying it out in the market. Similarly the approach to putting capacities should be based on belief that no one knows duration of the boom period or the duration of the downturn. When the paradigm of “I don’t know” is accepted, then one becomes wary of ideas, which are based on timing of the economic cycles. This implies that, based on current reserves of a company, large capacity enhancement plans needs to be broken down to smaller phases and triggers for new phases should be based on success and returns of previous phases. If one tries to invest massive amount of money (as compared to accumulated cash) based on a long term forecast, then one should be ready for big expensive downsides. The suggested approach of experimentation and rapid reaction takes away the need to continually look into the crystal ball for assurance. Interestingly “Stop worrying about the future and live in the present moment”, is not only a spiritual lesson for improved happiness, but also a practical approach for effectively managing an organization. Excellent article which completely gives different and meanigful view point of managing uncertainty.